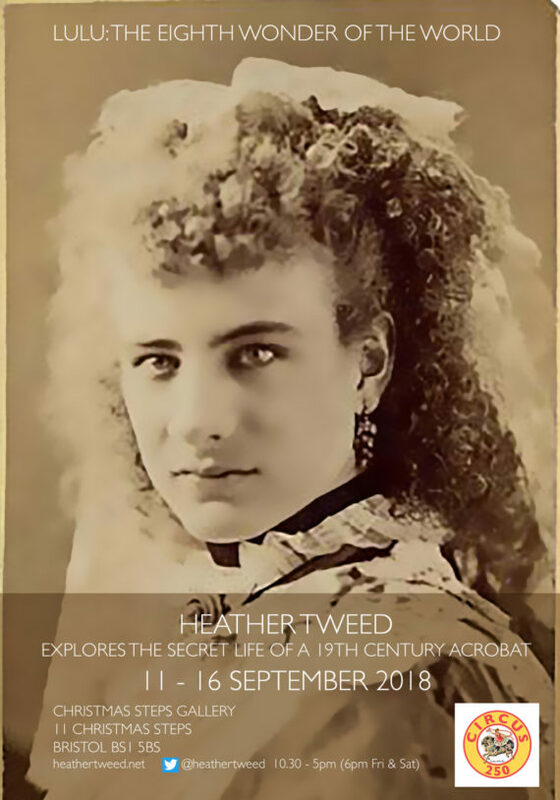 Artist and writer Heather Tweed unveils the secret life of 19th Century acrobat Lulu, in a new multimedia exhibition. Revealing her story through archival research. Lulu Farini was a beautiful, agile and fearless acrobat in 19th Century London. Admirers showered her with gifts and begged for her hand in marriage. Lulu had a secret! Artist and writer Heather Tweed unveils the secret life of Lulu in a new multimedia exhibition. Revealing her story through archival research. Plus new artwork from Venice 2017, and a few familiar friends from the classic Anubis Other World Tour as they return to Bristol to watch the show. Heather became entranced by Lulu when she was invited to submit an article to Ripperologist Magazine, from this grew a book Lulu: The Eighth Wonder Of The World, due for publication winter 2018. Zazel-The Human Cannonball will be published in the next edition of Ripperologist magazine in August.